Life at Stamping Details: Chris Cozen is coming to Stamping Details this weekend!! Chris Cozen is coming to Stamping Details this weekend!! Chris's garden is a constant inspiration to her and she plays with the shapes she sees in the flowers she grows there to develop simple and playful interpretations. We'll develop some rapid, colorful backgrounds then apply some paper elements, create our flower shapes and use our glazing techniques to refine and detail the piece. 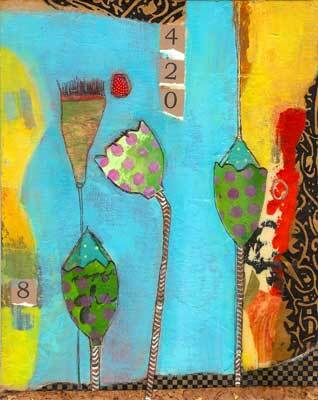 You will need three 8x10 canvas boards and a white gel pen for this class. Chris Cozen has always had a creative streak, dabbling throughout her youth without any formal training, taking a few design courses over the years. Trained as an educator, Chris spent 30 years as teacher, administrator, college Instructor, and Seminar Leader doing art when the time and space allowed. When she retired from Education in 2000, she built a studio and focused her efforts full-time on her art. Chris is essentially a self-taught artist with an innate understanding of color and design. 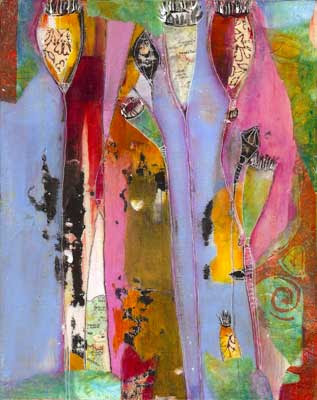 Many of her pieces are "stories" of people and experiences, enriched with pieces of family history. She especially enjoys collage and assemblage as they allow her to incorporate into her work "treasures" she collects that help her tell a story. 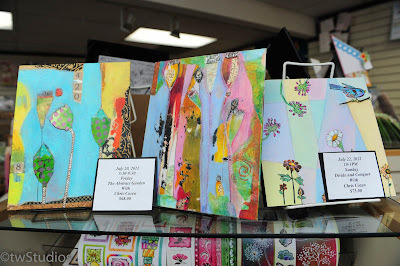 Both her mixed media canvases and her assemblages are colorful, whimsical, and intricate, building layer upon layer of meaning along with the color and collage elements. It is important to Chris that people engage with the story being told, even if they end up telling a different story than was in her mind when she began the piece. Since 2000, Chris has exhibited in Memphis, Nashville, The A.E. Backus Gallery in Florida, and the Chapelle des Penitents in Callian, France. Her work is held in private collections in California, Maryland, Tennessee, Florida, Canada, Germany, France, Israel, and Norway. She has also written three books: Altered Surfaces, published in 2008, and Transfers & Altered Images, published in 2009, and Mixed Media and Color, published in 2010. She is currently a member of Golden Artist Colors' Working Artist Program which was designed to provide artists with first hand experience of the variety of Golden acrylic products and their uses. Professional artists with extensive acrylic product training, such as Chris, conduct classes and demonstrations for artists and students working in acrylic or other media.